I can’t believe how quickly the time flies by. The Preakness is now over and on to the Belmont Stakes. I would like to congratulate the winner, Shackleford, and all of his connections on this victory. He ran a wonderful race, attended the pace the entire trip, and finished with true desire! My pal, Mr. Commons, ran a nice race from the 14 post. He also lost a shoe during the running. He came out of it in good order and is back home in California. He was already out relaxing and grazing this morning at Barn 55. John and Dottie are also back in California! They are so, so impressed with how many people in Maryland stopped them to ask about ME! I’d mentioned this the other day to you, but more and more people continued to come up to them and share their ZENYATTA STORIES! Dr. Grayson from Florida really touched their hearts. Then yesterday, while Dottie was leaving a church in Baltimore, Betsy, a woman who worked at the church, stopped to visit. She told Dottie and John that she and her friends read My Diary each day. She also commented that she has 2 photos in her office at the church: one of her husband and one of ME! This is TOO CUTE! I really can’t tell you how this makes me feel. Per Betsy, “I was very instrumental in UNITING people and uniting the sport.” What a kind thing to say! I must say, I am truly blessed to have so many endearing and supportive friends! On another TOO CUTE note, several people were also telling them that their license plates have MY NAME on them. One friend, Candy, received her plates as a birthday gift from her friends. They just arrived and are on her car driving around Lexington as I’m writing this. She sent Dottie this photo to share with all of you! If you see her driving around, please give Candy a big wave and a HIGH HOOF for ME! When Zenny says Mr. commons lost a shoe we know he lost a shoe! what a great picture Queen Z! We’ll have to figure out who is going to last in the Belmont! Either Shakelford or Animal Kingdom or a new shooter!! @Tory–Love your idea! Too cute! Oh..That is so special…We have a huge ford expedition that we call zenyatta….it doesn’t fit in the garage….I love you Z and E too!! You are one special girl! Poor Mr. Commons! I was wondering if something had happened, as he had been motoring really well, and then suddenly seemed to lose all momentum. I am glad to learn that he came out of the race okay. He and Mucho Macho Man can commiserate with each other! 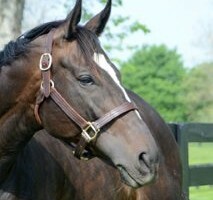 Isn’t it wonderful how many people in this country and all over the world appreciate the special magic of Zenyatta? Peple from all walks of life, and economic strata. Just say her name, and one can have a full-blown conversation with a total stranger (but you will part as friends). Z, there just is no limit to the many ways you inspire so many. I love you more than I could ever tell you.